Border Collies are generally very fit and active dogs, having the ability to do what they have been bred for, that is work stock. Even though some of today's Border Collies don't work they channel their energy and intelligence into many other activities including obedience, agility, tracking, showing and being an ever-so-active pet and member of the family. Any breed of dog, including the Border Collie, will suffer occasionally from illnesses and diseases that affect all breeds, but there are a few diseases of which Border Collie owners and breeders should be aware, and then manage, to prevent them from becoming an ever-increasing problem. If owners and breeders address these issues and share information it can only help in keeping the Border Collie the wonderful dog that we know today. The following information is only a summary of the details available for each of the diseases mentioned and some reasons as to why it is necessary to be aware that such problems exist within our chosen breed. C.L. is a disease that affects the cells of the body, and in particular the nerve cells. C.L. is not contagious but it is inherited by a simple recessive gene in the same way that coat colour is inherited. The disease will only manifest itself in dogs which have inherited the recessive gene from both parents. Other offspring of a litter containing an affected dog can either be carriers or clear. C.L. is characterised by the accumulation of ceroid lipofuscin, a waxlike lipid waste product of cell metabolism. This substance accumulates in the tissue cells of the body. In the brain there is limited room for storage of waste products and, as an estimate, at somewhere between 18 and 22 months of age, sufficient waste product has accumulated to begin compressing and destroying healthy brain cells. At this time the dogs display changes in behaviour, deteriorate rapidly and are usually euthanized. Confirmation of the disease is performed by brain biopsy. This can also be used to identify affected pups at approximately 7 months of age. Further research is needed to develop a DNA test to identify carrier animals. There have been approximately 36 cases in Australia of C.L. affected (clinically proven) Border Collies since the first case was diagnosed in 1980. When compared with the number of puppies produced during this time, it can be seen that this disease is very rare in the breed. At this time there are 30 published known carrier dogs. Carrier dogs can only be identified when they have produced affected offspring and the owners have given permission for the details to be published. There are other carrier dogs in the gene pool but as yet these have not produced affected offspring and therefore are not known at his time. There are some known carriers whose owners have not permitted the dogs' name to be published. Prospective breeders of Border Collies should be aware of the need for very careful selection of breeding animals to ensure that known carriers are not mated together. The majority of Border Collies today will have known carriers in a seven-generation pedigree. However when you have this information you can make decisions to ensure that you have one parent with relatively clear lines, or a small number of carriers well back in the pedigree of both sire and dam. Research continues at the University of New South Wales to locate the gene responsible for the disease so that puppies and adult dogs can be screened for the disease and determine if they are carriers or clear. The State Breed Clubs raise funds and donate it to assist funding this ongoing research. Unlike other breeds the Border Collie does not usually show physical signs of H.D. Border Collies can appear normal and have good movement, but on examination by x-ray clearly show that they are affected by H.D. to varying degrees. Border Collie breeders have been known to say that their lines are clear and that they have no problem with H.D. but unless they have all their breeding stock x-rayed and scored, this statement may not be true. If breeders have been scoring all breeding stock an offspring for many generations and the scores are low, for example less then 5, then they may consider that they have a reduced chance of producing a severely affected animal. All breeders at a minium should x-ray all breeding stock and submit all films for scoring. The importance of submitting all x-rays for scoring, no matter how bad they appear, is to get a true breed average. What has happened in the past is that x-rays that definitely show a moderate to severe problem are not necessarily submitted for scoring and therefore the score is not included in the data. We therefore end up with a breed average that is not necessarily a true reflection of the degree to which Border Collies are affected by HD. For example you have a dog that has received a total score of 13 but because only moderately affected dogs' x-rays have been submitted for scoring the breed average is 9, and therefore your dog may not be recommended for breeding because it exceeds the breed average. However if all x-rays were submitted the breed average may be 15 and therefore your dog would be suitable for breeding. The more Border Collies that are x-rayed and scored the better idea we have concerning this disease and the less likely it is that we will breed affected animals, and so improve the breed overall. Other breeds are undertaking such control measures through their club regulations. CEA refers to an inherited abnormality in the development of the retina, optic nerve and choroid. These are all structures at the back of the eye involved with vision. CEA is a multigenetic trait, is present at birth and does not change with age. If is strongly recommended that puppies 6 to 10 weeks are tested for CEA by a specialist eye vet (ophthalmologist). There are varying degrees of abnormality with CEA. It can affect one eye or both; from a mild case where vision may be reduced, to severe CEA with retinal detachment and total loss of vision. Just because an animal is mildly affected, one cannot assume that progeny will not have a sever case. The same may be said of dogs that hold clear eye certificates. They may carry CEA, and produce carrier or affected offspring. To produce affected offspring both parents must either be carriers or affected. Testing for CEA and other eye disorders involves no pain. It is performed using eye drops that dilate the pupil so that the ophthalmologist can examine the eye. Annual eye examinations are recommended to detect any abnormalities or the eye, but testing for CEA is only required once. These two diseases are becoming more apparent in the Border Collie. Both require further research into their causes, diagnosis, management and their impact on the breed. 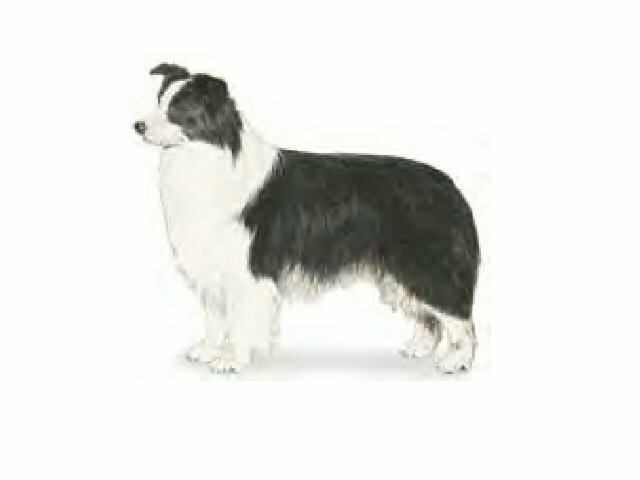 TNS was recognized in Border Collies about 8 years ago in New Zealand and Australia. Puppies aged between 6 weeks and 7 months have a range of symptoms including lameness, chronic diarrhea, fevers and loss of appetite. The pups also persistent bone and gastrointestinal infections. The bone marrow of the affected dogs identifies that neutrophils are not released into the circulation. Consequently, the bone marrow becomes clogged with neutrophils - a state called myelokathexis. It is thought the condition has a genetic basis, as there seems to be some familial correlation in the pedigrees of affected dogs. OCD is a degenerative disease involving the joint bone and cartilage. It is characterised by partial or complete detachment of a fragment of bone. It is caused by the interaction of a number of factors including a genetic predisposition as well as environmental conditions eg. over-supplementation. Nothing will be achieved by condemning fellow breeders if dogs are identified as carriers or affected with any of the above disorders. Instead, congratulate them on first testing and then publicising the results. These individuals are showing a responsible attitude and are helping to control hereditary diseases before they become a major problem. Please test your animals. If you don't test you could be adversely affecting the future of the breed. Further information on any of the above mentioned diseases can be obtained by contacting the Border Collie Club of Qld Inc. Canine Health Sub-Committee.